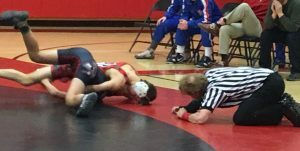 HYDE — There were only nine contested bouts in the dual meet between the host Clearfield Bison (2-4) and the visiting Flying Dutch of St. Marys, with the Dutch winning five of those bouts; but the Bison came away with their second win at the Weiss Gymnasium this week, 35-25. The dual wasn’t officially decided until the final match of the night when Bison freshman Nolan Barr ((7-6) dominated fellow freshman Lane Dellaquilla (2-4) by a 16-3 count. The match wasn’t without controversy, however, as Barr was hit with two penalty points – one an illegal chicken wing and the other a hands to the face call. With both of those calls coming in the first period, the score was only 5-3 in favor of Barr after one. But Barr turned the Dutch frosh for three in each of the final periods to secure the Bison team victory. An unlikely fall by Dellaquilla would have forged a 31-31 all tie. The match started at 120, where freshman Karson Kline (12-6) received the first of three Bison forfeits. The Dutch cut the Bison lead in half when junior Tylor Herzing (10-6) scored seven third period points in a 9-4 comeback win over another Bison freshman, Luke Freeland (9-8) at 126. St. Marys took the lead 9-6 after Marco Paropacic (3-4) took down and pinned Bison junior Peyton Smay (3-9) in 34 seconds of their 132 pound bout. At 138, the visitors widened their margin to 15-6 when senior Tyler Dilley also picked up a first period fall over Bison sophomore Justin Hand (3-6). Dilley was a PIAA state qualifier his sophomore season, but missed last year due to injury. Senior Jude Pallo (7-3) started the Bison comeback at 145 with a dominating performance on his feet, taking down Gregory Tettis nine times in an 18-7 major decision. The gap was closed to 15-13 the Dutch after senior Caleb Freeland (15-3) squeaked by Nick Crisp (3-2) by a 3-2 decision. The fourth freshman winner on the night for the Bison, 160 pounder Mark McGonigal (13-4) finally gave the hosts back the lead, 19-15, by earning the lone Bison fall of the evening over Austin Pritt (2-3) in 1:42. A 19-19 tie in the dual meet was forged when Johnny Wittman (7-5) was able to major decision Cole Smay (3-9) 11-0 at 170. Keeping the momentum going for the Flying Dutch was 182 pound sophomore Jeremy Garthwaite (9-4). Garthwaite held a slim 5-3 lead going in to the final period over Bison junior Brett Zattoni (3-10), but was able to reverse and pin Zattoni to give the Dutch the lead at 25-19. 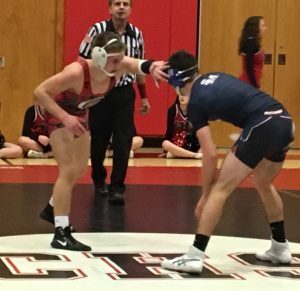 The lead was short lived, however, as, after no match was contested at 195, the Dutch had to forfeit the next two weights to Oliver Billotte (5-3) at 220 and Avry Gisewhite (9-8) at 285. Billotte’s win put the Bison freshman class at 5-0 on the night. The Dutch then had no other choice than to move their 106 pounder up to 113, setting up Barr’s heroics described above. The Bison (3-4) are now off until Tuesday when the head to Spring Mills to take on the Penns Valley Rams (9-1).